See things differently with these period victorian spectacles. Metal frames, clear theatrical lenses with UV 400 protection. Imported. I purchased these glasses to complete the character I am currently portraying. The glasses looked great when I opened the package but buyers should note that the glasses are made for an extremely narrow face. With a little bending and adjusting they can fit comfortably (I went to my optician for fitting) and the narrow width of the frame actually looks great no matter what size head you have. Just note that people with extremely wide heads will have some difficulty getting them to fit. Also there is no way to take the clear glass out of the frame and replace them with different lenses. Overall, the look is fantastic and the quality is good. I love the look of the Victorian Spectacles I purchased; however, they are absolutely to small for a normal sized adult. I read in a few reviews that they were small, and another few that said they fit well. I decided to gamble on my luck. I lost... They are wearable for a short period of time, but not for even a partial day of reenacting. Please understand that this is a product issue, not a Historical Emporium issue. I love the company and will continue to purchase from them...just not these glasses. This is certainly the best experience I have ever had on the internet. Your associate's are the best!!! Please keep up the good work. Good spectacle frames; will have my prescription lenses made to fit them. It would have been helpful to incorporate the width of the frames in the oolproduct information. Definitely small for a male but it fits fine for a female and they were VERY shiny so I dulled it down with nail polish remover to get the more authentic look. Overall I'm completely satisfied, but as long as people read these reviews and understand that the glasses are set to a small head frame they should be satisfied too. As with everything, it's not a one size fits all. It definitely isn't made for people with big heads. Fits me perfectly though and looks great. Quality is superb. They are not bad for what you pay for them. And the look is really classic. The good: The spectacles look sharp and give a nice Victoran flair. The lenses are smooth, with no distortion that I could make out.The bad: The frames are very thin; while mine arrived in excellent condition, it won't be long before the earpieces get bent out of shape. They are also narrow; if you have a large head, they will be tight on you. If you wear a large or x-large hat, you might want to give these a pass. When I called on the phone to place my order the employee was very helpful in choosing a pair of pants. I also ordered a pair of brown riding boots. In the past using other vendors I had to buy a bit larger size so I ordered the boots from you in a size 9 and they were way to big. I returned them for exchange for a size 8. They also seemed a little too big but with 2 shoe inserts they will work. I was also very pleased how quickly the size 8 were delivered. I have already started telling anyone I can think of about your web sight and recommending you to them. 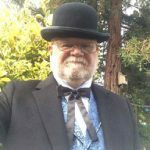 One of my nephew's is working in England and is into "Steam Punk" so I e-mailed him letting him know about your web page. everything was just as said. perfect.